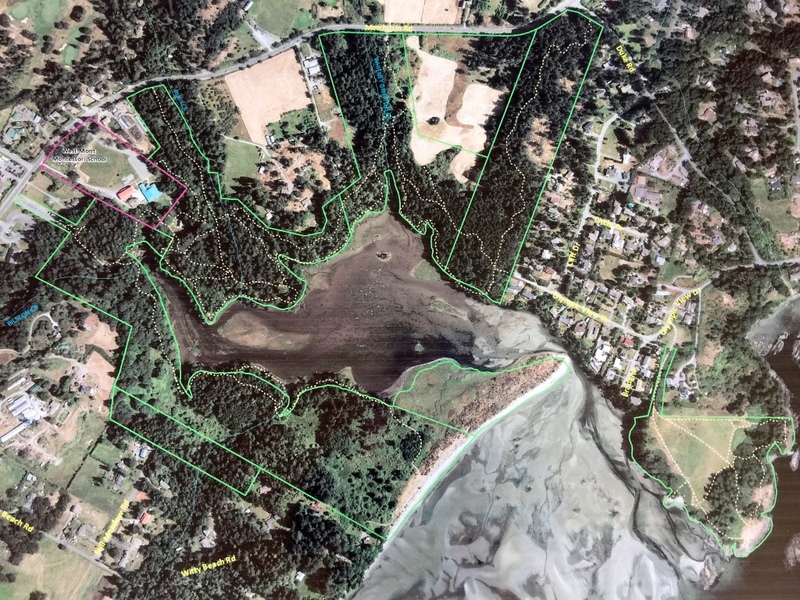 The Metchosin Biodiversity Project and its sponsor, the Metchosin Foundation, have developed tools to help both young and old Metchosin residents monitor and appreciate the natural environments of Metchosin. One resource is a set of 50 Nature Cards. The boxed set of Nature Cards contains 50 4” X 6” 2-sided cards printed on heavy-stock, waterproof, tearproof paper. The cards describe common plants—and one lichen—from Southern Vancouver Island. The team that created the cards analyzed data from the Metchosin BioBlitzes in order to determine which plants young people were most likely to encounter in the field. You can order a set of cards or download the PDF masters if you wish to develop your own application. Further information on the Nature Cards can be found on the Metchosin Biodiversity Project website. A second resource is a set of maps of natural features around both Hans Helgesen and Westmont Montessori schools. The maps show the school grounds, their surrounding areas, and the nearest regional parks. Satellite view: Hans Helgesen Public School and Devonian CRD Park region. Satellite view: Westmont Montessori and Witty’s Lagoon CRD Park region. Contour map: Hans Helgesen Public School and Devonian CRD Park region. Contour map: Westmont Montessori and Witty’s Lagoon CRD Park region. The Metchosin Biodiversity website has comprehensive list of species that have been identified in Metchosin, either through BioBlitz inventories or from historical documents. There is also a link to tools that can be used to appreciate the wild lands and species of Metchosin such as the eco-cards and maps.